For several decades after the Revolution, Paul Revere was as famous for his church bells as for his midnight ride. 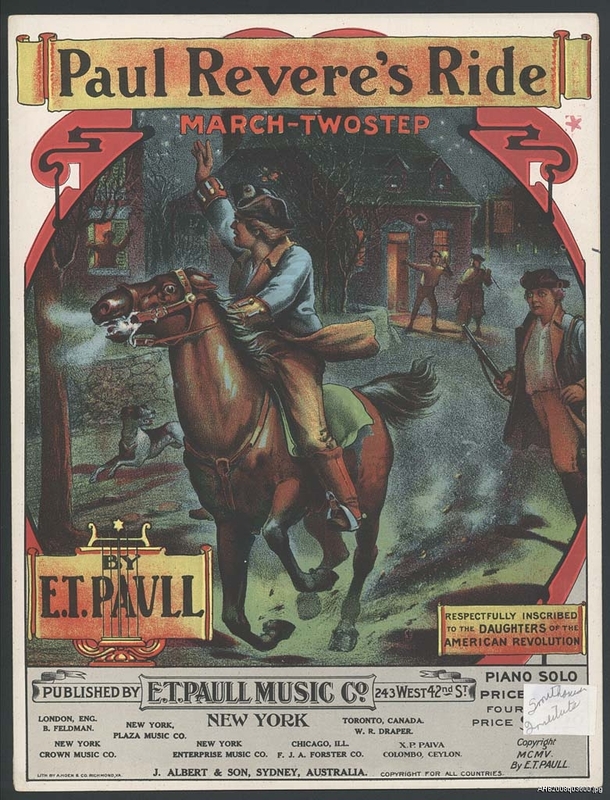 His role as a horse-powered early warning system filling the Massachusetts countryside with shouts of "The British are coming!" in 1775 did not become the stuff of legend until Henry Wadsworth Longfellow published his heroic poem "Paul Revere's Ride" in 1861. Yet he was always known as a man who could use sound in the service of his country. While he is often remembered simply as a patriot silversmith, Revere's career and reputation were far more complex during his lifetime. The opening days of the struggle for independence included the events that would eventually make him known to history, but he spent the latter part of the war under a cloud for the charges of insubordination leveled against him during the disastrous Penobscot Expedition, a chaotic naval operation that cost Continental forces hundreds of lives in 1779. Eventually exonerated of any wrongdoing, he continued to work to clear his name and improve his standing in the new nation. With military laurels beyond his reach, Revere sought to rise socially through business. He broadened his metal-working to include a bell foundry in 1792, when the congregation to which he belonged, the New Brick Church, required a replacement bell for its tower. 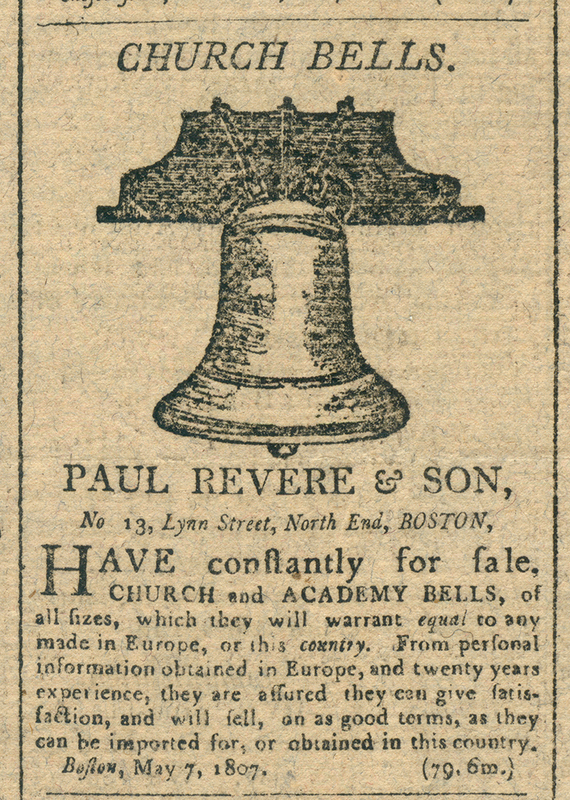 Between 1792 and his death in 1818, Revere's company—Revere and Son—made more than 100 bells. The family-run foundry would ultimately cast 398, with the last bell sold in 1828. No sudden leap from small silver items to bells weighing hundreds of pounds, the evolution of Revere's industrial interests was gradual. He opened an iron foundry before becoming a bell-maker, and the earlier experience allowed him to move toward making larger objects whose successful production was not just a matter of scale. "Bell-making remained a high-tech trade in Revere's time," the historian Robert Martello has written. As all the earlier large bells in the United States had been made in Europe and the industry was only beginning to take hold in America, Revere mastered the necessary principles of metallurgy and acoustics through a combination of trial and error and correspondence with experts both overseas and closer to home. After he had mastered bells, Revere expanded to cannons and then to rolled copper. As a man still known for his involvement in a stinging naval defeat, he might have felt some sense of vindication when he received a contract from the U.S. government to use his copper sheets to sheathe the hull of the USS Constitution in 1803. It was in the reception of his church bells, however, that the final rehabilitation of Revere's reputation can be seen. When his bells were considered for purchase, their shortcomings apparently mattered less to some than who their maker was, and what he soon came to represent. "Mr. Revere has not yet learned to give sweetness and clearness to the tone of his bells. He has no ear and perhaps knows nothing of the laws of sound," wrote Reverend William Bentley of the Second Congregational Church in Salem, Massachusetts, in 1807. Like others, however, Bentley made a point of purchasing a bell from Revere rather than an imported model. The reason? Many Americans "venture to prefer it to any imported bell & so did we," the minister explained, "but from patriotism." Overshadowed by the dramatic tales of his exploits in the cause of liberty as a younger man, the work that Revere came to as a bell-maker later in life may have contributed even more significantly to American history. While church bells had rung throughout the colonies before the Revolution, Revere's efforts at his Boston foundry provided an example to his fellow citizens of an industry long associated with European skills and craftsmanship that could prosper in the United States. The 1802 Revere and Son bell displayed in the National Museum of American History's new Religion in Early America exhibition hung for three decades in a Congregational church in Castine, Maine, and then for more than a century at Stevens Mill in North Andover, Massachusetts, before joining the collection of the American Textile History Museum in 1961 and the permanent holdings of the National Museum of American History in 2016. Originally crafted to summon the faithful to worship, the bell later served as a town clock, ringing to wake workers, signal shift changes, and generally regulate new patterns of labor during the Industrial Revolution. It remains a symbol of both the changes and the continuities in the communal life of the nation. Peter Manseau is the Lilly Endowment Curator of American Religious History in the Division of Home and Community Life. He has also blogged about the lost sounds of religious history.